After more than 10 years of proven performance, the ABL800 FLEX blood gas analyzer is now available in a new PLUS version. The ABL800 FLEX blood gas analyzer allows you to measure a full panel of up to 18 STAT parameters on the same blood sample. This supports fast diagnosis of critically ill patients and reduces the risks and patient discomfort associated with a need for collection of several blood samples. With the new smart design and improved user interaction of the PLUS version, the ABL800 FLEX analyzer makes your blood gas testing smarter than ever. Highly responsive tablet-like interaction, intuitive user interface, advanced help function. Fast and reliable results with analysis of up to three successive blood samples with the FLEXQ module. Capable of analyzing up to 18 STAT parameters on the same blood sample. 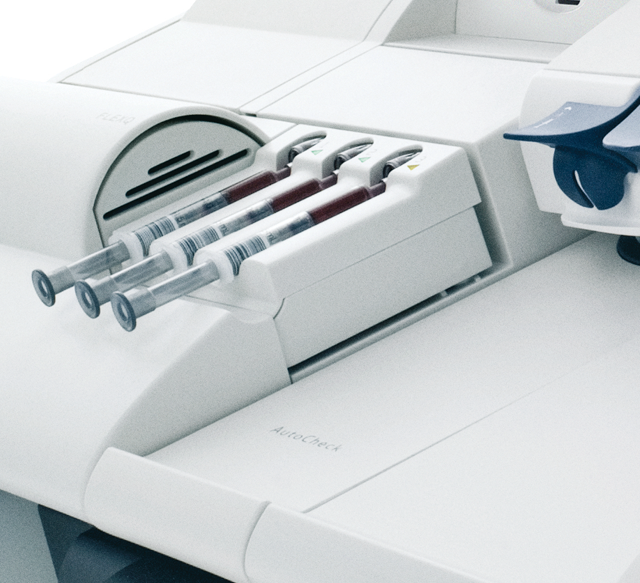 Full automated scanning and automated mixing of blood samples with the FLEXQ module. Reliable results for blood samples down to 35 microliter (μL) with the use of FLEXMODE and MICROMODE. With Radiometer’s data management solution, AQURE, results are automatically transmitted to wherever needed: Patient’s bedside monitor, and hospital and laboratory information systems (HIS/LIS). Get the new ABL800 FLEX analyzer brochure (no login needed). Login to the customer portal to download brochure, product specifications and other supporting material for the ABL800 FLEX analyzer. Want to know more about how to make high-volume testing automatic and accurate? I’d like to receive Radiometer news and information via my preferred channel marked below. I understand that I can opt out at any time. The unique FLEXQ module allows you to automatically analyze up to three blood gas samples in succession. With the ABL800 FLEX analyzer's Drop'n'Go functionality, there is no need to wait at the analyzer for patient results - simply place the safePICO syringe from Radiometer on the FLEXQ module, and the blood sample is automatically scanned, mixed and analyzed. With the FLEXMODE functionality, the ABL800 FLEX blood gas analyzer is also optimized for capillary tubes, allowing you to reliably get the most critical parameters from a low volume neonate sample. Depending on the available sample volume, the FLEXMODE functionality provides the highest number of parameters. Compact analyzer, specifically designed for demanding hospital wards like the ICU, the NICU and the ED. 19 parameters, 35 seconds, 65 μL of blood. Easy-to use blood gas analyzers measuring co-oximetry, blood gases, electrolytes and metabolites. Choose the parameter panel which suits your needs.